The Toronto International Art Fair has transformed slowly in the past three years since I have been attending. This year I worked on Friday and Saturday of the fair at the C Magazine booth. The fair now includes curated sections, namely Jeffrey Spalding's HEARTland exhibition at the top of the escalators/entrance to the fair grounds and the solo exhibition spaces including samples of the work of Canadian Art Magazine's imposed "10 to Watch" (Fall 2009 issue) including Hannah Adad, and Jennifer Marman and David Borrins among others (although the works by these artists in the solo spaces were also for sale under their present dealers, the space was positioned as a non-threatening-to-the-wallet sort of exhibition space). HEARTland was a well selected smattering of Canadian artists, with a noticeable and possibly reviewer-biased Nova Scotian representation with works by David Askevold, Eric Fischel and a few from Gerald Ferguson. The exhibition showed its experimental presence in its inconsistent didactic labels and its crooked vinyl title. Remarkable that an art fair set to make money, with months of planning and set up, still lacks in the presentation details that are meant to make products appear respectable, desirable and therefore sell-able. Because the exhibition was not for sale maybe not much time was spent as a non-profitter like me would have hoped. This exhibition has replaced the space where all the arts magazines set up their booths the past two years. Canadian Art, C Magazine, Esse, Border Crossings, Mass Art Guide, Allure and any others that have passed through before. Herein lies the indication of the political lay out of the TIAF. At the entrance of the fair, the visitor is greeted by an exhibition in the form of a promotional survey of Canadian artists with goals to "advocate on behalf of [Canada's] diversity, vitality, and pertinence within this context"...the context being the international art scene. A reflection on Canada's lack of recognition in the international art world disguised as a passive comment on multiculturalism and diversity. Economic politics, not altruistic artistic promotion (yes, I know, extremes). 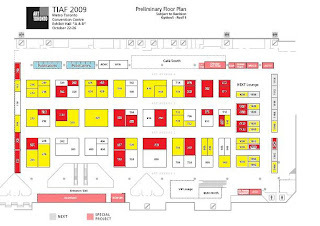 Red indicates international vendors; Yellow indicates Canadian (outside Toronto) vendors; White indicates Toronto vendors; Blue indicates publishers. Many of the Toronto commercial art galleries, along with comparable international examples, are positioned to the right side all labeled as "NEXT" to imply their up-and-comingness. International exhibitors are concentrated in the middle (with many simply from other provinces, so not quite international). The modern and historical art dealers to the left...and a bit towards the back. The arts magazines are plunked in a line next to the back toilets and the cafe, while other non-profit and public galleries making attempts to hold their own are positioned along the perimeter of the fair grounds (also by the washrooms in the case of the AGO and the RBC Canadian Painting Competition): the Art Gallery of York University, The Museum of Contemporary Canadian Art, The Art Gallery of Ontario, and the Leona Drive Project among others. With a largely Canadian focus, the question of who is using the fair becomes pertinent: are international buyers visiting Toronto or are international galleries looking for Canadian patrons? Or is this a play for Toronto to enter the international stage by continuing to participate in the phenomenon of the art fair? With send-off letters of congratulations from Michaëlle Jean, Stephen Harper and David Miller at the front of the TIAF catalogue, I would say it's more of the latter. The TIAF can't be a display of wealth and exchange but more of a participation and promotion of economic and cultural positive thinking. Since the recession has taken hold, and supposedly relieved, people couldn't have been spending money on something potentially considered by buyers as frivolous. The business association with Canadian Art Magazine and the "10 to Watch" smells suspiciously like incestuous promotion on a debatable world stage. The HEARTland exhibition's goal to present a survey of Canadian artists as an indication of support and promotion, or a sort of rallying cry, is as much for the Canadian audience as it is for the international. Since Canadians are as desperate for cultural identity as we are to display that Canadian identity within the context of international culture, both HEARTland and the "10 to Watch" presence of Canadian Art are microcosms of TIAF itself: an attempt to participate as an independent and distinct cultural producer on the world stage.